Upon hearing about Evolve for the first time many months ago, I recall a sense of giddiness. The concept just sounded so exactly like what I wanted from a co-operative multiplayer game. Asymmetrical, class-based, sci-fi hunting game. What? I would have daydreams of the kind of fun me and a small group of friends could have with a game like that. I even started planning LAN parties like it was 2004. But since that initial giddiness, I was lucky enough to get into the Big Alpha and all the subsequent testing weekend events. I've seen the game develop over the course of several months at this point, and I've also seen the volatile reaction people have had to the pricing model that 2K and Turtle Rock Studios decided to implement. 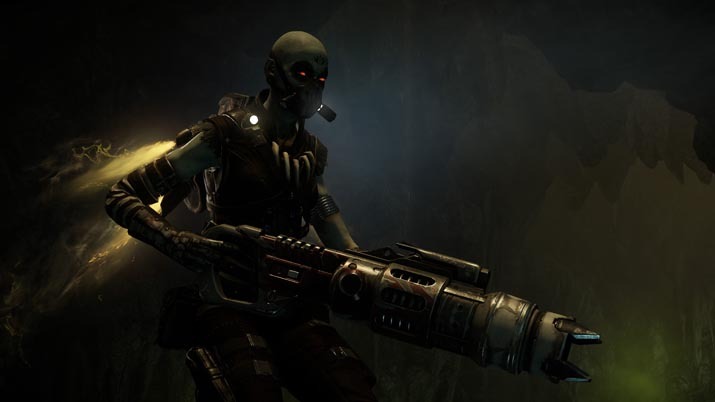 The controversy over Evolve's downloadable content – while it may be a valid gripe – has distracted from the actual game itself. For the sake of this review, I am going to leave any comment on the pricing in its own section. Let's talk games, not economics. 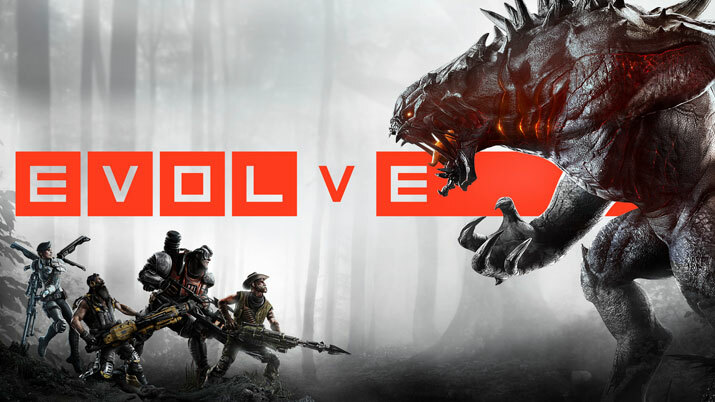 In concept, Evolve represents one of the most fun and unique ideas in a AAA game to come out in a long time: Four players of different classes hunt down a player-controlled monster that's slowly leveling up and gaining power to better combat the Hunters. The classes break down into four specialists: Trapper, Medic, Support, and Assault. Each class has multiple Hunters to choose from, with each serving the same basic function within the unit but having a slightly different way of getting things done. For example, all Trappers have a dome that traps the monster inside a small area, but only one has a pet that can track the monster, while another can plant sensor nodes that will trigger a ping on the map when the monster comes into range. Right when you feel like you've gotten pretty strong with a particular character, you've unlocked the next guy and you've got another set of abilities with which to tool around. At the same time, each character can gain levels within their own abilities, making them get stronger the more you use them. It's a nice but far from groundbreaking unlocking system that is just gratifying enough to make you keep going for the next perk, character, or ability upgrade. My personal favorite character is the first playable Support character named Hank. His laser cannon can deal big damage from long range and up close, his airstrike can end a fight quickly if the monster is stuck under its fiery rainstorm. But his Shield is the best part; he can cast a damage-absorbing shield on another Hunter that makes them invulnerable. When you're able to float around the tops of cliffs playing the shield fairy for all your teammates below, it's like you can actually feel the monster player pounding on their keyboard in red-faced frustration. For Monsters, there are four monsters included in the base game: Goliath, Kraken, Wraith, and Behemoth, all of which have very different play styles. The variation in the Monsters can make each hunt a uniquely fun experience and each has their own tracks and ways to move about the world. The Wraith and the Kraken can dart and fly making them far harder to hit, while the Goliath and the Behemoth are walking tanks that can throw the Hunters all over the map. In my time playing the monster, "tense" would be understating the experience. Being isolated, being chased, trying not to leave obvious tracks and constantly watching your back. It's a trip. My excitement about Evolve stemmed mostly from the co-operative aspects, but the more times I cast the Kraken's overpowered lightning strike into three Hunters, the more I enjoy playing the villain. Playing monster is a learning experience and if you're playing against a group of Hunters that know what they're doing, you have to move quickly and decisively. Once you're caught in the dome, there's no running, but there is hiding. An experienced player (Monster or Hunter) knows when to engage and when to minimize damage. As the monster, it's not always about being a badass, sometimes it's about making the right play and knowing when to escape to feed. 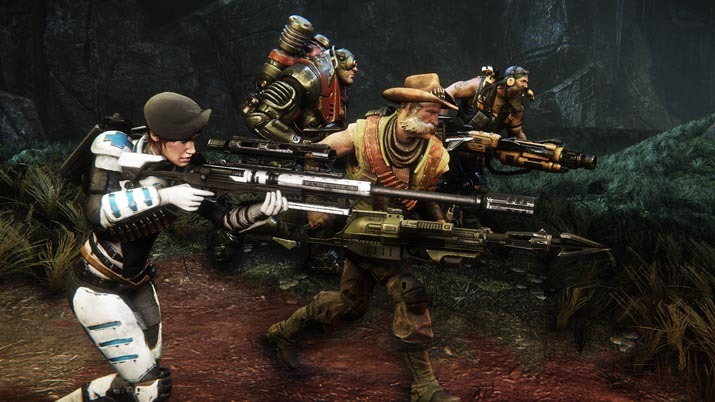 Evolve can be played in a few different ways, but the most straightforward game type is Hunt. This is the game of cat-and-mouse that everyone expected from seeing the trailers. You're following the monster's glowing tracks and looking for signs of action like broken trees or smoldering ground where the Goliath had used its Fire Breath. Then, you finally see your target in the distance. This is one of the better moments to be had in games right now. Finding the beast and hustling your friends to catch up. "Trapper, where the hell are you!" is something you'll find yourself saying quite often. When you finally take that perfect angle to cut off the monster, your heart starts to race and the big, dramatic moments start to pour out one after another. While there are more than a few things that need to be tweaked about the gameplay, the one thing they've nailed is creating that big cool fight where you're barking orders to your friends, and doing your best to counteract the monster on the fly. There were times that I wish there was a bit more to do in the process of hunting down the monster. A group is usually successful because they're able to find the tracks left by the monster and take an angle to cut it off. I really wanted there to be more to it than simply dumb luck. The conflicts with the Monster are a blast, but the lead up to those conflicts can be a bit boring. One of the single most important aspects of a chase is how well the Hunters manage their jetpack fuel which simply isn't very satisfying. I want to outwit the monster player, not just follow a repetitive pattern. The other variations on that base formula of fun are Nest, Defend, and Rescue. You'll be playing some combination of those throughout the five round campaign they call Evacuation. This may be where the game shines most, and the winner of each round gets some kind of advantage for the next one. For the Hunters, these advantages can be things like healing stations or a reduction in the range of the monster's ability to "smell." This all crescendos with one final round of Defend, where the monster and a handful of AI minions try to destroy a series of power relays. There is usually more than one fight in each round, so the game doesn't simply boil down to who walks away alive from the first battle. One thing I love about the gameplay is that each round usually consists of more than one fight, so a Monster isn't beaten if it loses the first bout. A good monster can run away, get some distance from the Hunters, find some fresh food to re-up the shield and then initiate another fight. As of this writing, we are nearing a month since the game has launched and there are still a number of annoying bugs that have not been ironed out. The most frustrating is the mouse cursor that decides to pop in and out of the game whenever it pleases. At the start of a match, I'll notice that my cursor has not gone away, even after dropping out of the ship and starting to run around in first person view, the cursor loiters around my screen. It's a small complaint, but it can be a bit disorienting to have your cursor floating around your screen when you're trying to aim. Then, after the match is over, the menu screen pops up and my cursor is nowhere to be found. Now I'm trying to navigate menus by using the subtle visual cues that occur when your cursor floats over an object! Maddening. I also experienced more than a few drops in my frames. I don't own an elite machine, but an Nvidia 770 4GB video card ought to be able to hold solid frames on Medium-High settings. Combine that with a handful of games that lost connections to servers and the occasional glitchy Monster jump and you'll find yourself pulled out of the experience more often than you want to. This is a big-time game on a big-time budget. A quick hotfix can cure these kinds of issues, but there's been only a few patches launched, none of them addressing these bugs. Although, to their credit, they have squashed a few that were more directly effecting gameplay. One fact really stands out to me in the pricing of Evolve and its DLC: there is no single purchase you can make that gives you all of the available content for the game. Even the $100 "PC Monster Race" version doesn't have all the skins. And, yes, skins are a dumb little aesthetic thing that only a few people are going to buy. But the thing is that this game is a bit thin on content and replay value. So when I go to the store page and see that they want to sell me different colored guns for $2, it's a natural reaction to question the motives of this game's development. I'm not going to beat this horse to death any more than every comment section and Reddit thread already has. 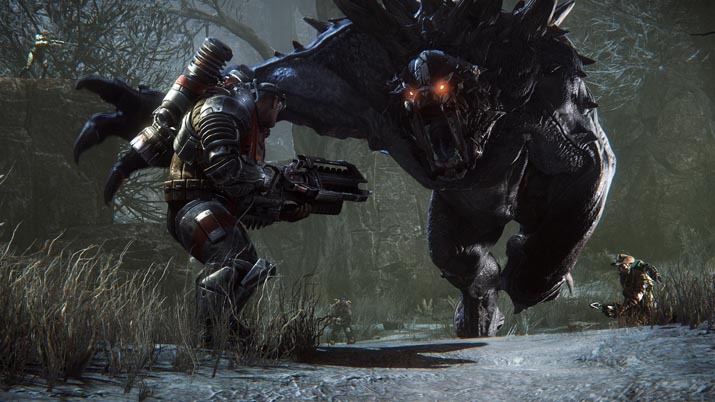 Evolve seems to represent the most extreme example of a troubling trend in video games. That's it. They've made it no secret that they intend to come out with more and more DLC as the game develops, but if they want people to keep playing that long, they're going to have to launch some DLC that has some real meat to it. Not just some bonus Hunters or monsters or maps, they need real gameplay enhancements and additions that make the overall experience more worth the heavy price tag. 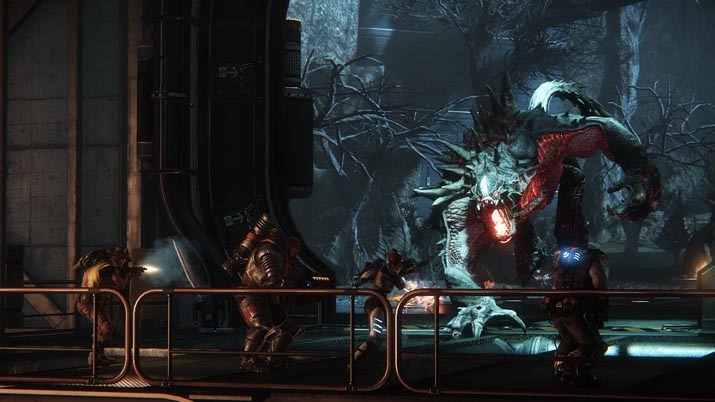 Like many critics have pointed out, there is a bit of repetition to the gameplay of Evolve. But the amount of fun I've had so far duking it out with a monster bigger than my house cannot be denied. Playing with friends, or at the very least playing with friendly people using their microphones can turn this game from good to "Where'd my night go?" At $60, the amount of DLC available at the launch of this game is a concern to say the least. Even so, there's still a very unique, wildly fun game buried beneath a big pile of frivolous downloadable content and some annoying bugs. If you have to wait for a Steam sale, I really can't blame you, but Evolve is a game that offers some thrills that you can't find many other places, so I have trouble telling people not to buy it. I want this game to survive and build on the excellent gameplay framework they've set up, but we must wait and see if the developers at Turtle Rock Studios and 2K want to make something great or milk it till it's dry. Time will tell.